These photographs were taken on August 6, 2010, during a visit to Applegate Pioneer Cemetery in Yoncalla, OR. 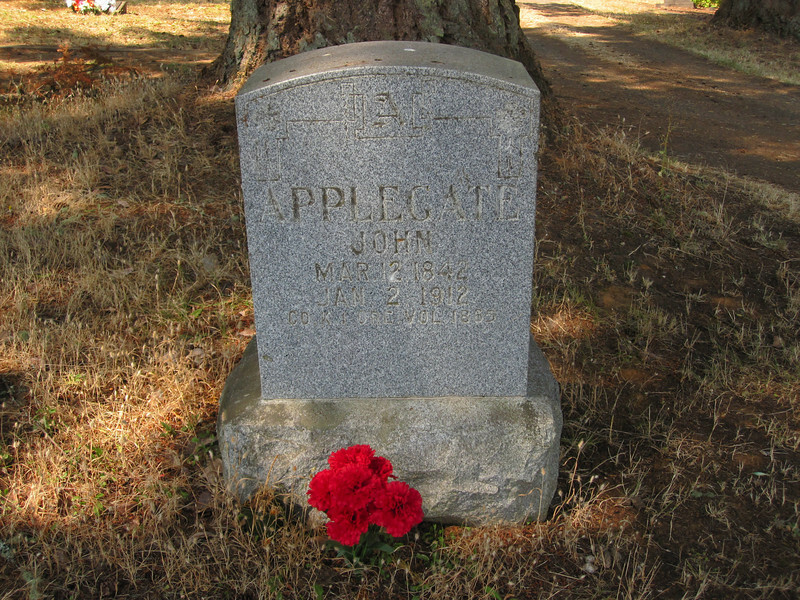 I have been wanting to visit this cemetery since I read Shannon Applegate's book "Living Among Headstones," in which she recounts her experiences as sexton of this cemetery, a responsibility she "inherited" as a descendant of the Applegates who were pioneers in this part of Oregon. It is a wonderful example of the historic cemeteries which form such an important part of the fabric of our country's heritage. We all owe a debt to those who struggle to maintain these cemeteries against the depredations of time and manmade wear and tear. This is a beautiful place. I photographed stones almost at random. Of course there were a lot of Applegates, along with families they married into or were related to. There are other graves as well, and I'm sure that not everyone in this cemetery was descended from or related to the Applegates. If anyone reads this who knows otherwise, please advise me.